Jawbone is one of the most popular names in portable audio and thanks to new piece of firmware, one of their offerings is now more versatile than ever. The updated software allows Mini Jambox owners to pair two speakers together to create room-filling audio. Specifically, the speakers can be configured to play an audio stream in unison – that is, having each speaker play exactly the same thing at the same time – or in stereo mode with one speaker handling the left channel while the other tackles the right channel. The pairing magic happens within the speaker Jambox, independent of the app or your smartphone. Essentially, one speaker talks to the other to control playback timing and the like. Once both speakers have been updated, simply press and hold all three buttons on the top of each device to link them together. The firmware also introduces a bit of a social twist by allowing a second smartphone or tablet to connect to the speaker grouping so two people can take turns controlling what is played. In the event you don’t have a second Mini Jambox at your disposal, you can still experience a three-dimensional listening experience using the new LiveAudio technology. It uses crosstalk cancellation filters to separate the left and right channels for a larger sound stage and more depth of sound without requiring headphones or two physical speakers. The new firmware can be downloaded for free from Jawbone’s website. 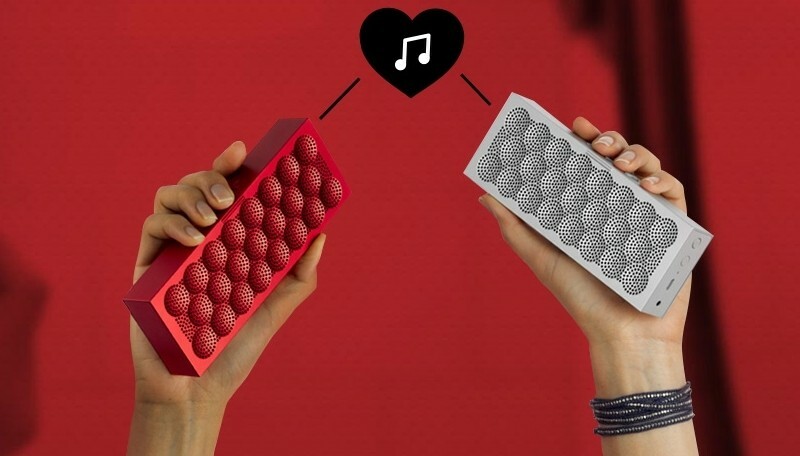 It’s worth pointing out, however, it only applies to the Mini Jambox – larger speakers from Jawbone need not apply.